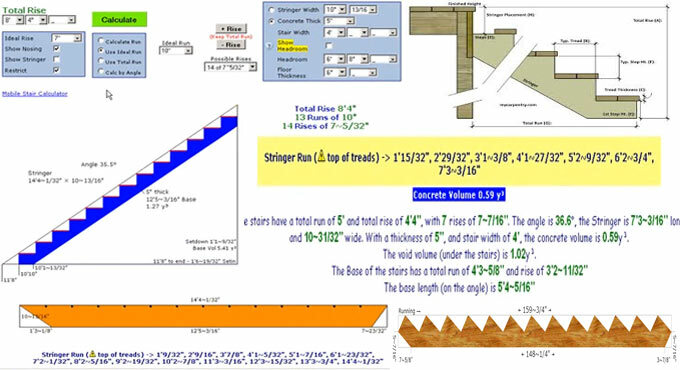 This construction video tutorial, provides demonstration of a stair calculator with complete plan. Besides, one will be able to work out the stringer, headroom online at free of cost. The calculator can make estimate with various units like feet, inches and metric. The calculator comprises of different sections titled as total rise, ideal rise, possible rises, use ideal run, use total run (inch), use stair angle, stringer width, concrete thick stair width, tread thickness, riser thickness, nosing, show headroom, floor thickness etc. Just put the desired values in these sections and press on calculate button to start the calculation. Follow some useful tips - Left click, release and drag to make calculation at full scale in top diagram - Click Stringer diagrams to draw at stair angle or level. To measure and demonstrate upper floor opening and headroom, provide upper floor thickness, highlight the Show Headroom check-box and choose either the Headroom or Floor Opening radio button. Choosing 'Headroom' will allow computing the upper floor opening from entered headroom. Choosing 'Floor Opening' will help in computing headroom from entered floor opening. Make sure to abide by the local building regulations concerning all stair dimensions. All Imperial inputs and dimensions belong to genuine physical finished sizes (unless otherwise noted). For online demonstration, go through the following video tutorial.